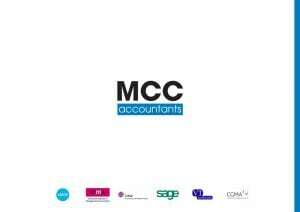 MCC Accountants are a well established chartered accountancy practice based in Salford and servicing businesses across Greater Manchester. Formed in 2009 to provide comprehensive business tax and management accounting solutions for small companies, sole traders and self employed professionals, we have expanded from just 15 clients to more than one hundred today. We deliver individually tailored services to a combination of sole traders, partnerships and limited companies across Manchester and Salford. As well as this, we have a strong vision for future growth as we add the provision of auditing, business consultancy and outsourcing to our portfolio of services. If you are looking for your first accountant or are considering a change, then please call MCC Accountants for an initial discussion.